There is often confusion between different types of invoice automation under the term ‘e-Invoicing’. Invoice automation via scanning and Optical Character Recognition (OCR), is the digitisation of paper-based invoices upon receipt by the buyer. Issuing PDF invoices via email is another form of automation, but while it removes paper from the process, it does not provide full integration. Both of these methods are often referred to as e-Invoicing, but are not really considered to be ‘true’ e-Invoicing. True e-Invoicing fully automates the invoice capture and receipt process, so the buyer does not need to perform any data entry – that’s because invoice information flows directly from the supplier to the buyer’s back-office system, requiring no manual intervention by the buyer. 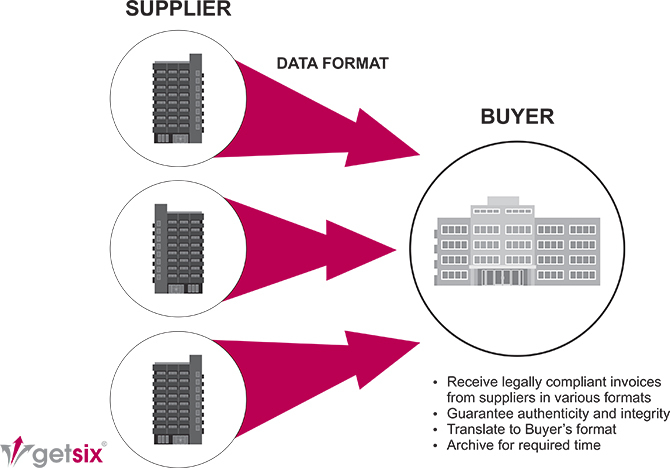 The buyer receives invoices from its suppliers using formats that have been agreed in advance. The invoices may include mechanisms – such as digital signatures and EDI – that ensure their authenticity and integrity. They will arrive at the buyer in a format that can be integrated into their ERP and then archived for the legally required period, without being altered in any way. The diagram below illustrates e-Invoicing with compliance. In essence, there are really 2 types of ‘true’ e-Invoicing that you need to understand. e-Invoicing with or without compliance. The buyer receives the electronic invoice in a format ready to be processed by the Accounts Payable (AP) system. In this instance, the e-Invoice conforms only to the data formats that are established by the trading partners. It does not accommodate the regulatory obligations of the countries, in which, the electronic invoice is issued or received. In some cases this is because some countries have little or no e-Invoicing regulations, and others because companies choose to capture the B2B efficiencies, while running a tax compliant paper process. Paper is fully removed from the process. It makes sense for an organisation to adopt this approach as it will facilitate their VAT obligations. However, there are no standard regulations governing e-Invoicing. Instead, there are widely varying, country-specific approaches – ranging from complete prohibition to almost no restrictions – that any company trading internationally will have to understand and accommodate. Although the scanning of paper-based invoices isn’t considered e-Invoicing, it is the natural first step for many organisations. Using OCR software, the data can be moved from a paper-based format to a digital format that can be entered in the AP system. OCR is not an error-free solution and legibility issues with the original invoice will necessitate manual data entry to resolve any issues. In most cases, some manual data entry will be required. Once an OCR initiative is introduced, your organisation can benefit from some time and cost savings in the routing, approval and payment of invoices. However, this approach should only be seen as a short term measure. Issuing a PDF invoice by email, whether compliant or non-compliant, does remove paper from your process, but it creates new problems for your customers. The customer’s AP department still has to capture the data from the PDF, and this can only be achieved by separate OCR technologies (sometimes printing the PDF invoice) or by keying the data directly from the PDF image. While PDF invoices can be a good first step on the road to true e-Invoicing, they do not provide the end-to-end integration. One of our e-Invoicing experts would be happy to answer any questions you have. Simply ask our e-Invoicing experts.